613 Beautiful little house with very pleasing usage of outside spaces. Small rustic house with swimming pool and olive groves, located in a panoramic position near the village of Benabbio, near Bagni di Lucca. The property is accessed via a private drive that leads into a parking area. You reach the house via an elegant external staircase made with brick and stone. This property consists of a house of about 45mq. plus a large porch, on two levels. First floor – bedroom with access via an internal The room is spacious and bright. Ground floor – an open-plan room services as a kitchen, dining and living room, with 2 entrances that lead on to the patio terrace. On this level is the bathroom with shower. The doors lead directly on to the patio areas. This covered area has an external kitchen with barbeque, a dining and lounge area. This large patio complements the internal living spaces, creating a pleasing ‘outside/inside’ living dynamic. Alongside this area there is a wooden annex used for garden tools etc. There is a path that leads down to the pool via a pleasant stairway with flowers and shrubs. The pool is made of reinforced concrete and measure 3 metres by 6 metres with lounge areas and some shade. The property has charming terraces with olive and fruit trees. It may be interesting to note that during the summer period the property is rented out to mostly foreign clientele. 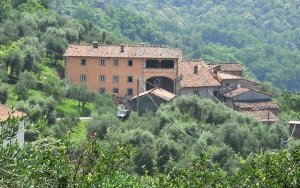 Historic Villa, completely renovated, is situated in the rural hillside village of Benabbio, Bagni di Lucca. This property, located in the hills near the city of Lucca, dates back to the year 1863. 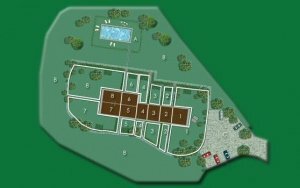 Noble estate near to Lucca with quarters for paying guests.